That was before the tornado sirens started. It was a long night in Bloomington, IN as we received the lines of storms that did damage across the country. Fortunately our house and neighborhood once again escaped any damage. A few miles south of us, friends were not so lucky. 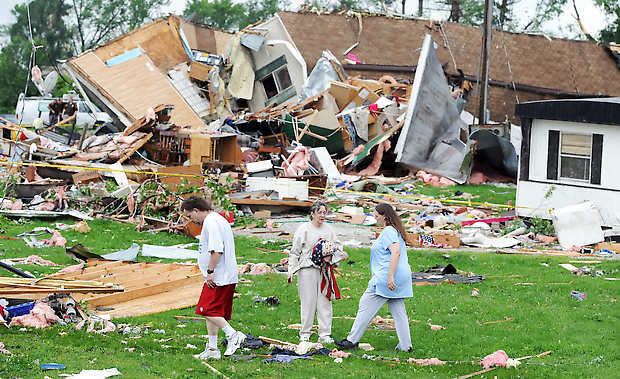 Part of the roof of the Sam's Club was blown off, the mobile home park (photos above) was destroyed, several large trees were down, and tractor trailers were blown over. Friends of ours in an apartment complex near there reported roofs blown off and they are still without power. Very fortunately, we are hearing of no fatalities and only non-life-threatening injuries. I spent last night Facebooking with friends to see what was needed (thank you social media!!). This morning many roads are still closed and there is little that I can do physically as far as offering assistance. So I did what I could do - got the kids ready, ran on the treadmill, and now offer a bit of information to you. If nothing else, this is a reminder of the blessings I have. As I held my children last night in our basement during one of the tornado sirens, I just cuddled them and knew that things were ok. As I ran this morning, I felt the sweat and slight pain and euphoric strength and knew that things are ok.
As you read this, no matter what destruction lies around or within you - take a breath. Take another one. And know...things are ok.